The man you see hard at work above is Jim Chattin, the new coordinator for Rural Action's Forestry Program. Originally hailing from the great city-state of Chicago, Jim felt a little restless with the opportunities for meaningful work in the big city. He was a forester in search of a forest and he found exactly what he was looking for in our Appalachian hills. Now an Ohioan for over 12 years, Jim has brought his considerable experience and skill to the offices of Rural Action. One of the initiatives he's most excited about tackling is the possibility of introducing carbon credit trading to local landowners. "It's a very interesting proposition" he says "and it provides an economic incentive to keep forests forested and brings more property under sustainable management. It also provides an alternative to extraction for local landowners who are looking for other ways to profit from their property. It's a more sustainable income that leads to a more sustainable forest." Jim is currently working through the various regulations and talking with groups like MACED (Mountain Association for Community Economic Development) that can help to bring this opportunity to our community. 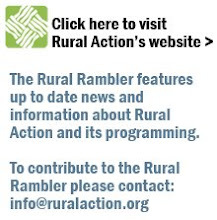 As he settles in and begins work on this and other initiatives, feel free to drop by the RA office in Trimble or drop him a line at jim@ruralaction.org.